Against the background of frequent organisational changes and restructuring, often based on impulsive decisions rather than structured feasibility studies or evaluations, this article examines the influence of decentralization on the performance of an extension organization. Based on a survey of 353 respondents from Oromia region, one of the nine regions in Ethiopia, representing various agro ecological zones and managerial positions, it examines the current level of organizational performance, the influence of the 2002 restructuring on organizational performance and the factors influencing the organizational effectiveness. The knowledge of these influences is important for improving the current and future design of organizational change and development practices. The findings show that the current organizational efficiency is low. The effect of the 2002 restructuring on organizational performance was mostly small or negligible. The organizational performance was influenced by various factors; the most critical being skilled manpower, availability of accommodation/offices, extension teaching aids; farmers' motivation, collaborations between institutions, government policy & regulations and political forces. These findings can be useful in assisting managers in their endeavours to correct weaknesses and to focus on the most critical issues for the improvement of organizational performance. Keywords: Extension, perception, decentralisation, organizational efficiency, operating efficiency, processes efficiency, organizational health, performance measurement. Extension organization accountability began to be looked upon as a serious issue in the early 1980's, and has intensified continuously since then (Richardson, 2007). Extension organizations have been called to task to provide justification for their existence. This means, according to Alex et al. (2002), that extension programmes should not only be relevant to the needs of clients but also be accountable in terms of the funds used and results accomplished. Assuring relevance and cost effectiveness calls for regular monitoring and evaluation. Ethiopia, it seems, seeks to meet the ever-increasing performance and accountability challenges by continuous restructuring. For example, between 1989 and 1990 the public extension organization has been restructured more than ten times (MOA, 2001). Large-scale structural changes were in 1991 with the devolution of power from the central Government to Regional States Governments and in 2002 the decentralization process was taken further to district level. The intention was to improve the accountability of public service organizations focusing on a more "private businesslike" management system. This new public management system has focused on more "accountable management" or "businesslike" control based on formal performance agreements. In this context, continuous systematic evaluation and monitoring are essential for an extension system to function efficiently as intended, and to determine if modifications are needed to meet changing conditions or demands. According to Bembridge (1980) much of the evaluation research in extension has been focused on behavioural change on the part of the farmer. By focussing on the farmer the most important factor in the process and the one that can most easily be adjusted, namely the extension organization itself, has been neglected (Röling, 1970). The Ethiopian situation has been characterised by movement from one extension approach, structure, focus and controlling systems to the next without a thorough and systematic evaluation of the previous ones so as to learn from previous experience (Fasil & Habtemarium, 2006). Useful efforts in this regard include studies by Gebre-Selassie (2001), Habtemarium (2005) and Fasil & Habtemarium (2006) but they did not look at organizational efficiency holistically, or made a comparative study of the situation before and after the changes were implemented. The purpose of this study was to contribute towards these challenges by investigating the current efficiency level of Oromia Bureau of Agricultural and Rural Development (OBARD) in regard to extension service provision. The specific objectives are to examine: the current situation of overall organizational functioning, the prominence of the 2002 organizational interventions, and the determinants of organizational effectiveness. The study was undertaken in Oromia Region, which is one of the nine regions of Ethiopia. Using purposive sampling, Oromia region was selected mainly for reasons of cost saving (proximity to Haramaya Univerity) and because it is representative of most of the country's agro ecological climate zones (such as high, middle and low altitudes) and all main types of agricultural enterprises (MOIPAD, 2001 & MOFED, 2005). Extension staffs from five of the twelve zones (selected on the basis of their representation of the Region) were selected and from each zone all extension personnel as well as extension specialists working at regional and national headquarters were invited to participate and received questionnaires. Of the total of 566 who were invited 353 (162 managers and 191 non-managers) correctly completed and returned their questionnaires, which represents a response rate of 62.4 percent. Using a pre-tested and validated semi-structured interview schedule the interviews were conducted in group sessions at various venues (such as at each district, zone, region and national offices levels). Instrument reliability was estimated by calculating Cronbach's alpha coefficient values. These were 0.85, 0.88, and 0.70 for the variables of organizational efficiency, organizational resources and external environment respectively. The data was coded and analyzed using the Statistical Package for Social Sciences (SPSS) program. Three main dimensions of organizational efficiency were identified, namely operating, organizational health and process efficiency aspects. An organization is said to be efficient and its progress sustainable, if it performs well in all aspects of these three dimensions of organizational efficiency (Thompson & Strickland 2001). The research findings are focused on these three performance dimensions of organizational efficiency as influenced by the 2002 decentralisation as well as by other determinants of organisational performance. According to Fry & Killings (1995:5), the measures of organizational operating efficiency focus on the activities related to an organization's objectives, such as profitability, financial position, and market share. In the context of non-profit organizations, organizational operating efficiency refers to tasks and activities related to the organization's operational goals. Seven variables were identified and operationally defined to measure the operating efficiency level of OBARD. They are: (1) Extension delivery effectiveness in terms of both quantity (target farmers' reached by services) and quality (impact of extension messages on target farmers) of services; (2) Resource utilization efficiency - manpower, time, finance and materials - to achieve organizational goals at district level; (3) Resource utilization efficiency - manpower, time, finance and materials - to achieve organizational goals at regional level; (4) Financial resources availability at district level; (5) Financial resources availability at regional level; (6) Return on investment in extension (input-output ratio of investment in extension expressed as a return per 100 Birr invested in extension by OBARD); and (7) under efficiency (the percentage of their current work time that respondents would require to achieve what they are currently doing assuming that they were highly competent, productive and effective). Using a 10-point scale, these variables are applied to measure the operating efficiency level of OBARD in terms of before and after the 2002 decentralization except the last two variables (return on investment in extension and the perceived level of under efficiency), which are used to assess only the current efficiency status. These results are presented in Table 1. 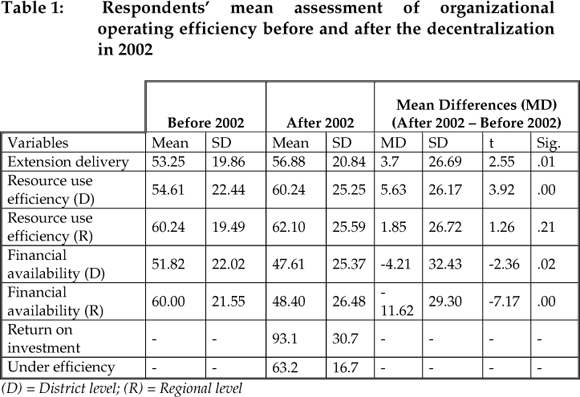 The influence of decentralization on the organizational operating efficiency of OBARD is, in general, somewhat limited but more significant at the district level than at regional level (Table 1). The biggest positive change is in resource use (manpower, time, finance and materials) at district level (Mean difference =5.6 percent; t=3.92; p=0.00). But noteworthy is also the increased extension delivery of 3.5 percent (t=2.55; p=0.01) which was achieved in spite of a reduction in the financing of 4.2 and 11.6 percent at district and regional level respectively. In this view of extension delivery, the respondents' were further probed, although not in terms of before and after, regarding the degree to which the investment in extension is worthwhile in the context of the current situation. The responses accorded in Table 1 reveal that the return on investment in extension of OBARD is perceived as 93.10 percent. This means that for every 100 Birr invested in extension, the return is currently estimated as 93.10 Birr. This implies that the organization is working at a loss. This was further supported by a high degree of perceived under-performance (36.8 percent). On an average, the respondents were of the opinion that they could have accomplished the same work in 63.2 percent of their normal time with better training and support. This represents a big potential improvement, which can be exploited if the reasons are known. Organizational process efficiency refers to the level of consensus regarding goals/procedures, cooperation and smooth flow of work, ideas and information (Fry & Killings, 1995). Three variables were selected to capture this concept, namely: coordination (among departments and between stakeholder organizations in confronting common problems and finding synergistic solutions), communication (communication and openness between workers/managers and between organization's managerial hierarchies), and participation (involvement of subordinates or workers in decisions that affect them). Using a 10-point scale the process efficiency level of OBARD before and after 2002 was measured (Table 2). 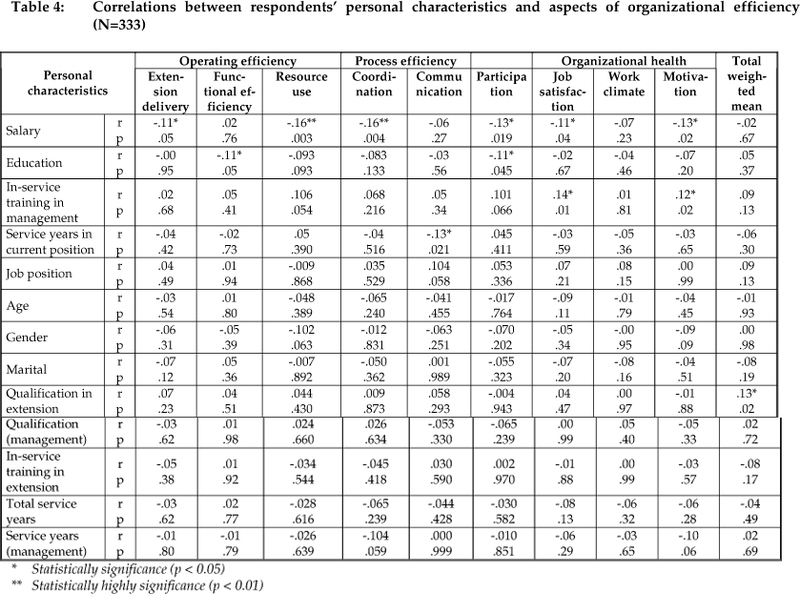 According to Table 2 all variables of organizational process efficiency show an improvement after decentralization, except participation of staff/workers at Region level. The biggest improvement is recorded in the area of extension workers' participation (involvement in decision making) at the district level (mean difference of 8.14 percent; t-value = 5.30; p=0.00). It appears as if the improved participation at district level might have happened at the expense of participation at regional level, which showed a decline, although not statistically significant (mean difference =-0.67 percent; t-value=0.43; p=0.67). Organizational health refers to non-financial aspects of organizational performance, such as human outcomes and interpersonal relations. Three variables were selected, namely job satisfaction (the extent to which the job provides interesting tasks, opportunities for learning and to accept responsibilities), motivation (achievement recognition and justice in workers' placement, transfer and promotion) and work climate (trust and support among workers and between subordinates and managers). Table 3 summarizes the results. According to the results in Table 3, the overall organizational health efficiency showed the least improvement with restructuring. In fact in all cases there has been a decrease in efficiency, highly significant in the case of motivation (mean difference = -8.3 percent, t-value = -4.83, p = 0.00) and job satisfaction (mean difference = -7.0 percent, t-value = -4.61, p = 0.00). This decline could be attributed to what Fry & Killings (1995) observed, namely that management might have applied pressure for short-term results and avoided investment in organizational health aspects like training, working conditions, and other internal concerns. With the government's current political and administrative agendas of decentralization; amalgamation and downsizing of public institutions, many members of staff have been deployed or were moved from the regional and zone offices to the districts. This could explain the negative influence on work satisfaction and motivation. This does not bode well for extension. According to Adams (1990), in organizations, such as extension, which depend on staff commitment, success primarily rests on the extension workers' motivation (willingness and commitment to serve and strive towards organizational goals) and capacity to communicate with and to get cooperation from target farmers. In such organizations, management that cannot motivate its staff is bound to be ineffective. It appears that field extension workers were doing their job in the field independently with no or little supervision regarding the quantity and quality of work performed. Various factors, which, according to the literature, can be expected to have an influence on organizational behaviour, were identified and categorised into personal, organizational and environmental variables or behaviour determinants. Subsequently their influence relationship with organizational efficiency was investigated by means of correlation and regression analyses in an effort to find evidence in support of the research question, which states that what factors are currently influences, in terms of facilitating or constraining, the organizational functioning of OBARD. The socio-economic characteristics of employees are important in order to understand who they are and the effect of their individual differences on organizational performance. According to Gibson, Ivancevich and Donelly (2000), the level of individual and/or organizational performance of an institution can be determined by the nature of its people e.g. individual differences, regarding perception, motivation, desire for involvement and value of the person. To be successful in matching a person's abilities and skills to the job, a manager must examine required and possessed behaviours. Thirteen variables concerning respondents' socio-economic and demographic characteristics were identified. 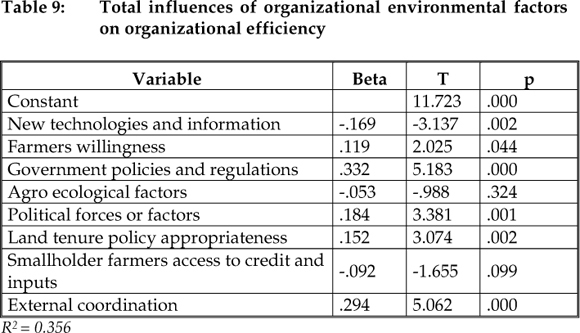 The emphasis here is on the influence of these variables on the different aspects of organizational efficiency (Table 4). The overall impression is that personal variables have little influence on the way the organizational efficiency is perceived. An exception is the level of salary, showing significant relationships with most of the efficiency aspects. However, in all of these cases the correlations are negative, which implies that higher earning respondents tend to be more critical as far as the organizational efficiency is concerned. This corresponds somewhat with the findings of top managers who earn the highest salaries and can be attributed to the close correlation between salary and management level (r= 0.534; p=0.000). The only other determinants having a limited but noteworthy influence are education and in-service training, but a more valid indication of the comparative influence of these variables can be achieved through regression analyses, the results of which are presented in Table 5. 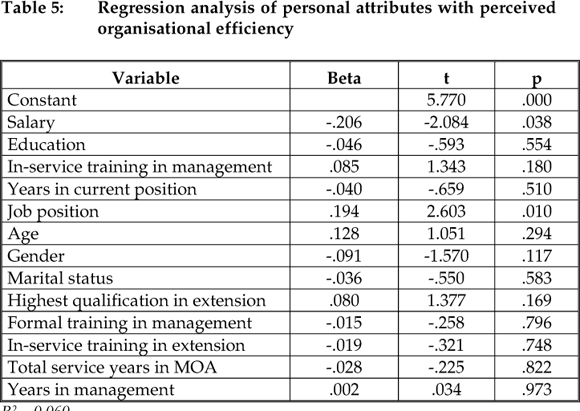 The results in Table 5 confirm that salary and managerial or job position are the variables contributing most significantly to the variance of the perceived current organisational efficiency. Nonetheless, the total contribution of personal characteristics towards explaining the efficiency variance is only six percent, which is reflected in the significant R2 of 0.060. Thompson and Strickland (2001) are of the opinion that the strength of an organization's resources and its ability to mobilize them in a manner that will increase its competitive advantage are the major determinants of how well the organization will be able to perform in the light of prevailing competitive conditions. The organization's strength is described by them as something it is good at doing or a characteristic that gives it enhanced competitiveness. A weakness, on the other hand, is something an organization lacks or does poorly (in comparison to others) or a condition that puts it at a disadvantage. An organization's internal weaknesses can relate to (1) deficiencies in competitively important skills or expertise or intellectual capital of one kind or another; (2) a lack of competitively important physical, organizational, or intangible assets; or (3) missing or weak competitive capabilities in key areas. The internal organization variables selected and analysed refer to skill of personnel and various aspects of resource adequacy (Table 6). 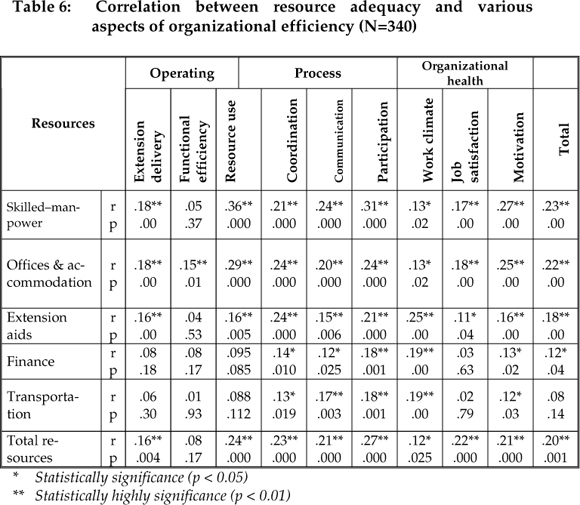 The results in Table 6 show that all of the selected resource variables were significantly correlated with most measures of organizational efficiency. Based on correlation coefficients and their level of significance, availability of the skilled manpower and offices/accommodations can be considered as more important, because of their stronger and more significant association with all organizational efficiency variables. The results of regression analyses have also supported these findings (Table 7). Out of the five organizational resource position variables, skilled manpower and offices & accommodation are the variables contributing most significantly to the variation of the current organizational efficiency. The overall contribution of these variables is only 10.1 percent (R2 = 0.101) but higher than that of the personal characteristics in explaining the dependent variable variation, namely total organizational efficiency (10.1 percent). The external environmental factors consist of two main aspects, the task and the general environment. While task related environmental factors are referring to an organization's competitive conditions, factors of the general environment are related to what an organization is complying with (Cummings and Worley, 2001). A total of eight variables (four for each aspect) were identified and their relationships with the different organizational efficiency aspects analysed (Table 8). 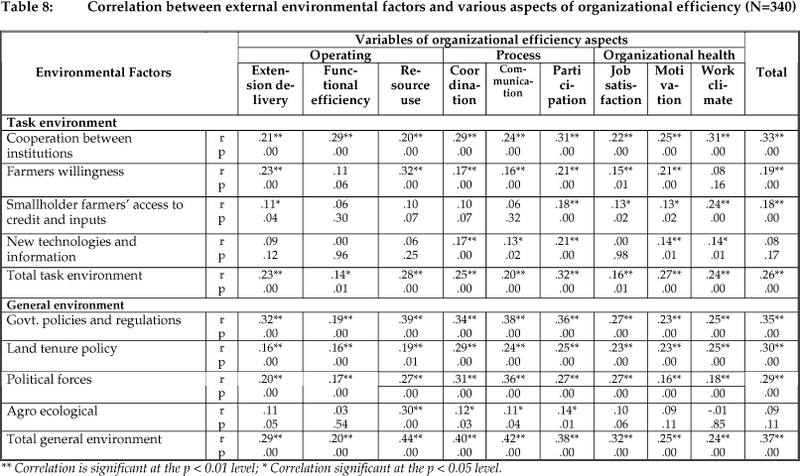 In general these findings (Table 8) reflect a close association between the environmental factors and organizational efficiency aspects. In fact, the majority are significantly correlated with all the organisational efficiency measures. The close relationships are underpinned by regression analyses of which the results are summarised in Table 9. The external environmental variables emerge as the factors contributing most towards explaining the variance of the current organizational efficiency situations, namely 35.6 percent. This is reflected in the significant R2 of 0.356. Except agro ecological factors and smallholder farmers' access to credit/inputs, the influences of all variables of external environment on general organizational performance are significant at the one percent significance level. This represents clear evidence of the influence of environmental factors on organizational efficiency in the Ethiopian situation. Government policies and regulations, cooperation between supplementary institutions, and political factors were found to be the most prominent in terms of influence. Decentralisation is one of the major restructuring operations recommended and promoted world wide. However, this study comes as a sort of disillusionment regarding the outcomes frequently associated with and expected from such a change, in the sense that the results are in general less dramatic than expected and can be both positive and negative. On the positive side is a 3.5 percent increase in extension delivery in spite of a significant reduction in financial means and a very significant increase of participation of 8.4 percent at District level (but negative at Regional level). This is largely off-set by a significant decrease in motivation, job satisfaction and provision of financial means of respectively 8.3, 7.0 and 11.6 percent. The direct implication and possible consequence is that the improvement may only be of a short-term nature and could be reversed and even turned around (become negative) if what was forfeited in terms of motivation and job satisfaction is not corrected or improved by management. To be able to do this more specific research is required. As far as the determinants of organizational performance are concerned, the contribution of the external environmental factors (35.6 percent) far exceeds that of the internal factors (10 percent) and personal characteristics (6 percent). This emphasizes that the success of any organizational restructuring is ultimately a function of the situation, but also why every restructuring is not necessarily an improvement. Restructuring should only be allowed after feasibility studies have been conducted, and even then the implementation should be carefully and intensively managed. Restructuring should not be an excuse for managers to start a new leaf. Finding valid and reliable measures for the quantification of effective organizational management is something that deserves the attention of future research. Only then will it be possible to analyze the causality relationships more accurately.